With the Nube Blanco Interlocking 12 in x 12in. Mosaic Wall Tile, it's easy to add a splash of contemporary styling to your decor. This unique design features an arrangement of random sized glass and stone arrangement on a 12 in. x 12 in. mesh sheet that makes installation a much easier process. With trendy shades of glass stips with white stone bricks, this tile creates a distinct look that is desirable for kitchens, bathrooms and other residential or commercial spaces. With MSI Stone ULC 12 in. x 12 in. Desert Fantasy Interlocking Glass-Stone Mesh-Mounted Mosaic Wall Tile, a seemingly random blend of Brown/White natural stone and crystallized glass strips forms this 12 in. x 12 in. mesh-mounted tile, infusing your space with a clean look and a contemporary ambience. These tiles accentuate any installation with various design options. Add a splash of sophistication to your decor with Ayres Blend Mosaic Tile. A seemingly random array of crystallized glass bricks forms this mesh-mounted tile, infusing your space with a sharp look and contemporary flair. The high-sheen, smooth-finished 12 in. x 12 in. tiles from MS International add definition to any residential or commercial expanse and are versatile enough to be used outside or on a fireplace surround. They look particularly striking as kitchen backsplash or shower wall, and also work splendidly as a countertop surface or accent panel. Add a splash of chic styling to your decor with Everest Interlocking Porcelain Stone Blend Mosaic Wall Tile. A seemingly random blend of stone and tile strips forms this 12 inch x 12 inch mesh-mounted mosaic, infusing your space with a sharp look and contemporary flair. The mixed-sheen, mixed-finished tiles from MS International add definition to any residential or commercial expanse and are versatile enough to be used outside or on a fireplace surround. Boasting natural white marble interspersed with crackly porcelain chips, they look particularly stunning as kitchen backsplash or bath wall, and alwork splendidly as a countertop surface or accent band. Nube Blanco Interlocking 12-inch x 12-inch x 6mm Glass Mesh Mounted Mosaic Tile With the Nube Blanco Interlocking 12 in x 12in. Mosaic Wall Tile, it's easy to add a splash of contemporary styling to your decor. This unique design features an arrangement of random sized glass and stone arrangement on a 12 in. x 12 in. mesh sheet that makes installation a much easier process. 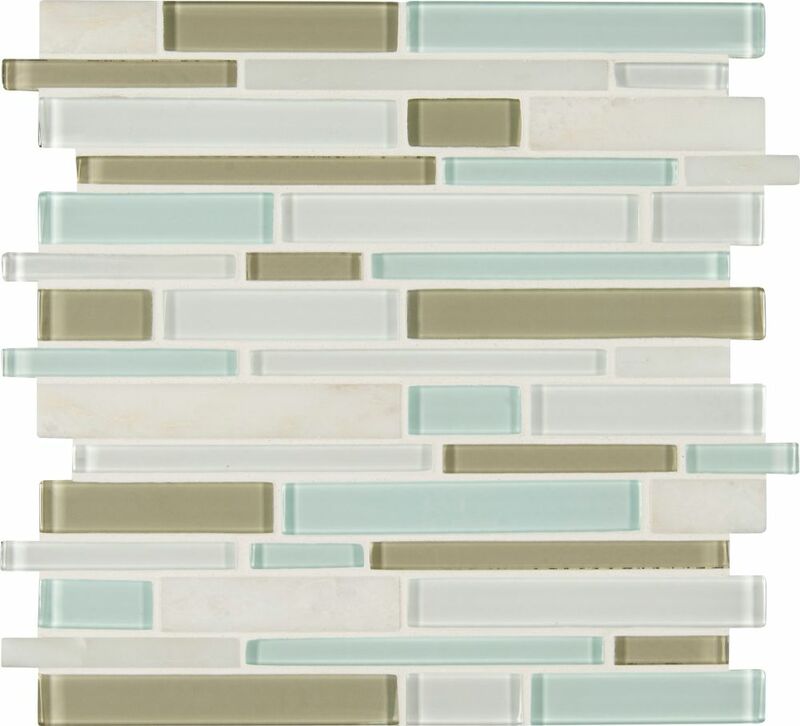 With trendy shades of glass stips with white stone bricks, this tile creates a distinct look that is desirable for kitchens, bathrooms and other residential or commercial spaces.